Selenium is a mineral nutrient that is a key component of several enzymes, some of which are important antioxidants. One of these antioxidants protects developing sperm from oxidative damage, while another selenium-containing protein appears to be involved with sperm production. In addition to antioxidant activity, selenium is involved with control of thyroid hormone, protection of the cells the line blood vessels and immune function. 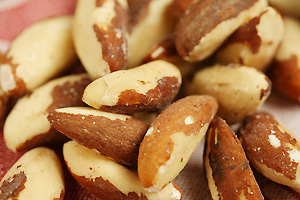 Brazil nuts are extremely high in selenium. Depending on growing conditions, 1 oz may contain 10-times the Adequate Intake for an adult. What Happens If You Don’t Get Enough Selenium? Selenium deficiency is rare when people eat balanced diets. Deficiency causes a variety of health problems, depending on the severity. Critically ill people who were on tube or IV feedings that didn’t contain selenium developed heart inflammation and muscle weakness and wasting. In region of China where soil lacks selenium, people develop a particular form of cardiomyopathy associated with selenium deficiency. Children in these East Asian regions can develop cartilage disease and osteoarthritis, also linked to selenium deficit. Impaired immune function ad increased susceptibility to viral infections is also associated with selenium deficiency. Poor selenium status is linked to higher cancer rates, but increased selenium intake for people who already consume enough doesn’t appear to protect from cancer. Because selenium is a mineral, toxicity is a risk with chronically high intakes, typically from supplements. Symptoms include hair loss, nail brittleness, skin rashes, digestive disturbance, a garlic breath odor and nervous damage.